Happily Ever After: Theme Wedding Ideas — Everybody's Invited! If someone were to ask 6-year-old Tara what she thought her wedding would be like, I probably would have described something pretty close to the story of Cinderella: a castle, a horse-drawn carriage, a gorgeous gown, glass slippers, and, of course, prince charming. Theme weddings go beyond a basic color palette. They range from classy to fun to downright geeky, and usually tell us quite a bit about a couple’s personality. Weddings inspired by fairy tales (like this Alice in Wonderland wedding and this Peter Pan-inspired wedding) are like a couple’s retelling of their favorite childhood stories. There are also music-themed weddings, like this adorable Beatles wedding, and decade-specific weddings, like this 1950s theme wedding. 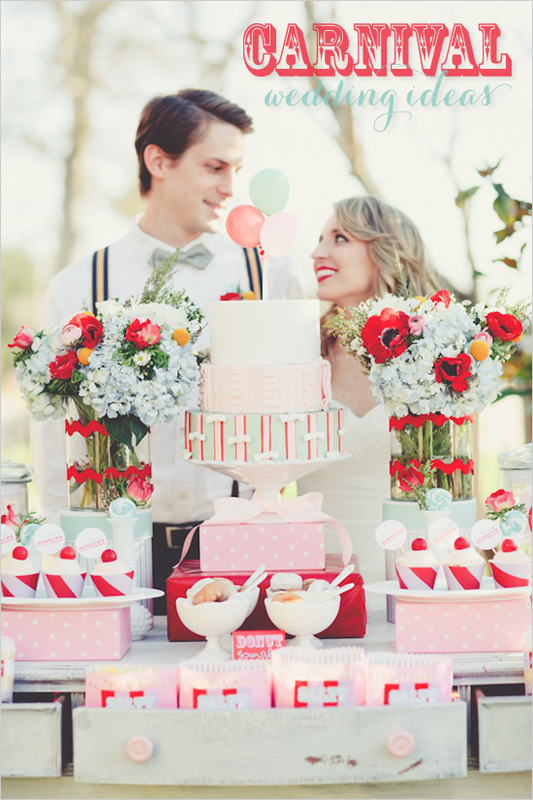 Carnival and circus theme weddings are popular, as are travel theme weddings. Some theme weddings get pretty geeky, like this pixellated Minecraft theme wedding (for the non-geeky, Minecraft is a game), and this “geeky elegant dino museum wedding” (including a giant T-Rex skeleton – yes!). What’s your dream theme wedding? Or how would your 6-year-old self respond to this question?